If you prefer lamb to beef, then this is probably the beef dish you’ve been waiting for. 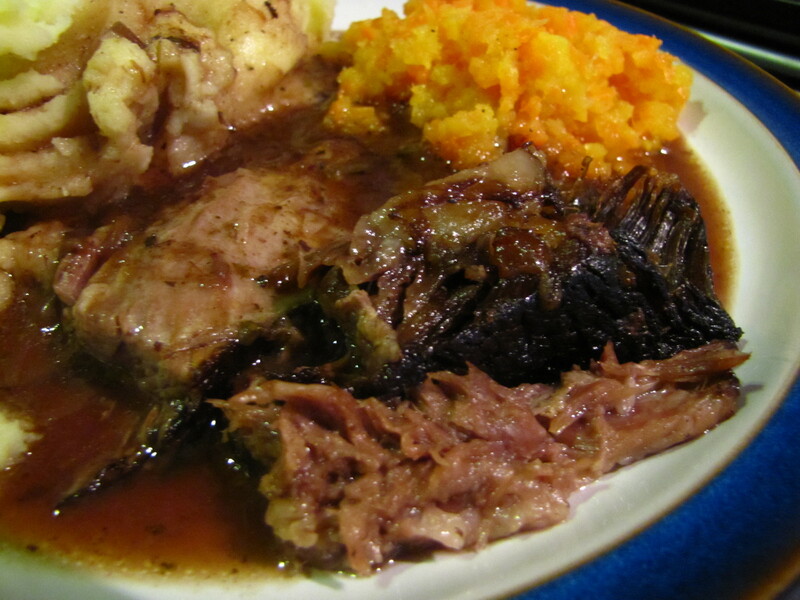 The lusciously moist, rich meat has much in common with roasted lamb. I came across a cut of beef in the local Farmers Market which was unfamiliar to me – ‘Rising Beef’ it was called. It looked just like a beef version of belly pork, with strips of fat-flecked meat in between thick strips of fat. It was clearly a cheap cut and I was curious to see what I could do with it. After a bit of research, I’m still none the wiser on ‘Rising Beef’, and I wish I’d taken the opportunity to ask the butcher, but I believe this is the actually the Thin Rib‘ of beef. Often used for mincing, or for stewing steak, the Thin Rib is a fatty, tough cut which benefits from long, slow cooking. This isn’t a recipe which you can rush, but it doesn’t involve a lot of effort. Once it’s in the oven, it just needs a little TLC and benefits from being cooked the night before. james……if you slow slow slow roast it over a shallow bain marie, the steam puffs the meat away from the fat…hence rising rib….. Sounds great – thanks, I’ll give that a try!